Isn't that where they've currently got the temporary shelters they set up to try to help with the massive homeless tent city? I wonder if this building is supposed to be a next step in that to provide a more permanent place for them. ALDI as of this afternoon. You can't really see in this pic but it looks like some of the shelves in there are already stocked with various dry goods. Nice! 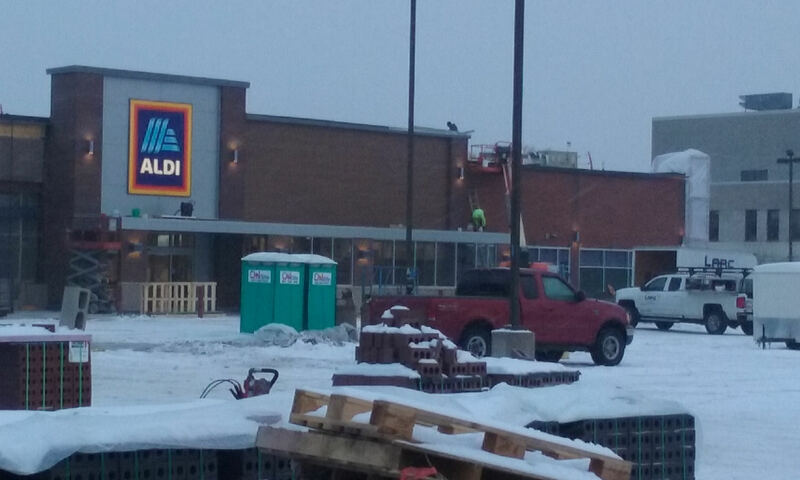 Was there any word/sign on what is next to that new Aldi in the other part of the building? Also, the Target remodel finished up in the last week or two. Major improvement, looks way better. They've started tearing off the front awning bit of the old Rainbow. Looks like the strip will be getting a face lift. It also looks like Target has started mobilizing for their renovation project. Are there any details on how long the renovation is expected to take? Looks like quite the setup with that whole corner of the parking lot taken up with the tents and materials. Yaaay Trader Joe's opens today! Saw a few employees heading in wearing their shirts on the train this morning.